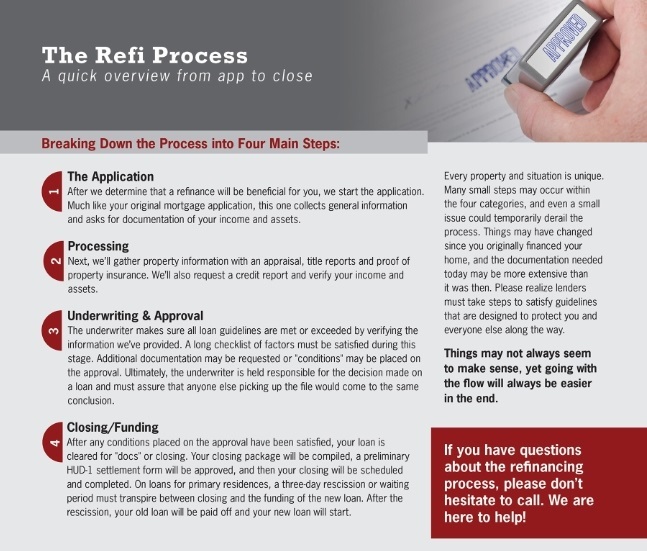 The Application: After determining that refinance will be beneficial for you, we can start the application which is very similar to the original application once you bought the house. Your loan officer will collect the initial documents which could consist of assets, income and other verification. Processing: Next, it’s getting the processing started which is gathering the homeowners insurance, title, ordering the appraisal and ordering all other verifications. Underwriting and Approval: The underwriter will review all the provided information and documentation to make sure they do meet the lending guidelines. Additional documentation may be requested during this process as the underwriters are held responsible for the decisions they make and have to make sure anyone else picking up the file comes to the same conclusion. Closing/Funding: After all the conditions are met, underwriting will give us the clear to close and green light to move to the final step. The closing package will compile all documents and provide us with the closing disclosure which you have to approve 3 days before closing (business days as Sundays don’t count). There is a THREE DAY RECISSION OR WAITING PERIOD and after this three days your Home loan will be funded and your old loan will be paid off. Every situation is different, and many small steps will accrue between these 4 steps. Please realize we all have a common goal, and that is to get your loan closed and funded with the best options as we value our clients business and their investments. Please call or email any of our loans officers for any questions. 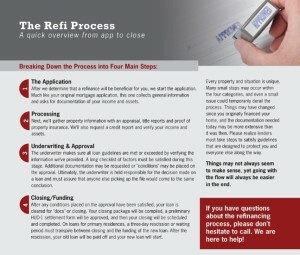 also, Visit our full Mortgage refinance page.